Martin Tripp has made a powerful enemy. With a net worth north of $20 billion who might hold humanity’s future in space, on Earth, and even below earth, Elon Musk is probably pretty high on the list of people you don’t want as your enemy. Now, he’s got a new mission: destroy Martin Tripp. Alright, “destroy” is a strong word. He probably just wants to bankrupt the guy and leave his reputation in the gutter. So, who is Martin Tripp and what did he do to piss off Musk? According to Musk’s email, the saboteur said his actions were a form of retaliation toward Tesla for passing him up for a promotion. Martin Tripp was that employee. But we didn’t learn that until Tesla filed a lawsuit against him on Wednesday. Tesla’s suit alleges that Tripp hacked Tesla’s computer systems, stole gigabytes worth of confidential data, and told news outlets straight-up lies about the company. Tesla said it planned to prove exactly how much it deserved to receive in damages during the trial, but given the claims in Tesla’s lawsuit, you can bet it’s not peanuts. So, to Tesla, Martin Tripp is a disgruntled former employee. Tripp, however, sees himself as something else: a whistleblower. 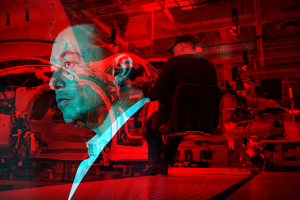 Earlier this month, Business Insider published an article claiming an anonymous source told them Tesla was generating tens of millions of dollars in waste and producing cars with potentially faulty batteries. On Wednesday, Tripp admitted in an interview with The Washington Post that he was that source. He also told the paper he “could literally care less” about not getting a promotion and was simply attempting to inform the world about what he saw as a potential danger. So in the brief time in which Tripp has been on Musk’s radar as a potential threat, he’s already facing a lawsuit from a multi-billion dollar company and accusations of being a potential mass-shooter. Even if Tesla’s lawsuit doesn’t go the way the company hopes, hard to believe the past few days won’t make others think twice about crossing Musk in the future. Tesla Will “Enable Full Self-Driving Features” in August. Here’s What That Actually Means.